Ornamental peppers are generally grown as decorative elements for their dainty, colorful fruits on compact plants. While they are edible, be cautious; nursery grown selections may have been treated with pesticides commonly used on ornamental plants. Can be grown outdoors in a container or in the garden through the summer, as well as indoors year-round. Perfectly sized for border fronts. 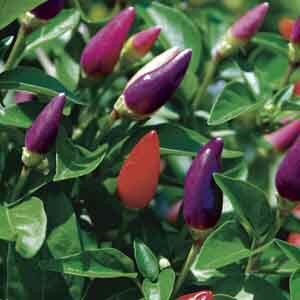 Very easy to grow in virtually any location. Best in fertile, well-drained soil. Water as needed to keep soil evenly moist, especially in hot weather.